SACRAMENTO — UC Davis Chancellor Gary S. May, Gunrock and other campus ambassadors, during a visit to Natomas High School last week, encouraged students to set their sights on a university education. "Keep dreaming big," May said April 19 in addressing some 500 grade 9 and 10 students at an assembly. "We can't wait to see you on the campus." The event — including classroom presentations on financial aid and a college information fair — was part of Achieve UC, a systemwide effort to expand the number and diversity of California students enrolled at UC campuses. Through school visits, leaders from UC’s undergraduate campuses ensure students know that a UC education is affordable and attainable. Gealani speaks at her alma mater. 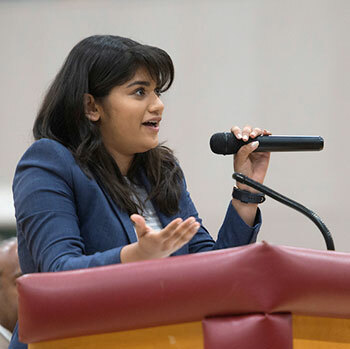 UC Davis senior Rooha Gealani encouraged students at her alma mater to draw on all the resources available to them. An immigrant from Pakistan at age 11, she said she might have had to figure everything out for herself as a first-generation college student. But participation in the on-site activities of UC Davis' Early Academic Outreach Program (EAOP) helped her find a path to university, access other help and learn from mentors. Gealani graduated from Natomas High in 2014. Now a double major in history and human development, she plans on a career helping meet the mental health needs of immigrant and refugee children. EAOP, which organized last week’s event, offers student advising and, through a cohort program, works with students from grade 8 through 12. It serves more than 2,800 students in 15 high schools and 16 middle schools in Sacramento, Yolo and Solano counties.